Statewide Forms? Not so fast. To try to help people out, the Supreme Court of Ohio has amended the Ohio Rules of Civil Procedure to include some domestic relations forms that can be used in any county in the State of Ohio. At last! Things are getting easier for the average Joe, right? Not so much. 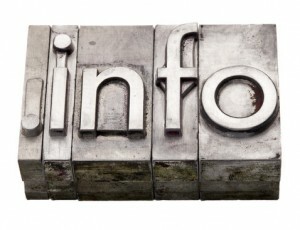 While every county is required to accept the Supreme Court’s forms (a link to that form and many other forms can be found at http://www.cornwell-law.com/forms/. For temporary orders, the temporary orders forms can be used for temporary orders in divorce in legal separation cases. HOWEVER, and this is a big HOWEVER, the county can still require you to submit their own local form in ADDITION to the Supreme Court’s forms. Even worse, some counties are amending their local rules to require both. Keep in mind, these forms still do not take the place of narrative affidavits which are not required, but are a good idea. You can also find the forms here: Appendix of Forms to Ohio Rules of Civil Procedure. For more information on Family Law in Ohio, check out our main website. Do you or have you had a divorce, custody or visitation case? Were temporary orders issued in your case? Are you in a position of preparing your own case for temporary orders, or your own temporary orders affidavits? Tell us your story! If we like it and think it may be helpful to others, we’ll publish it. Temporary Orders in divorce, custody and visitation cases. Will I get to see my son or daughter at all while the case is in court or do I have to wait until it is all over? Does paternity have to be established before I can get temporary orders? What will the court put in temporary orders? What do I have to file to get temporary orders? I pay child support for another child. Will the court take that into consideration? Who will pay for the mortgage if I move out? Do I have to pay her alimony (spousal support) while we wait for our divorce? What if I give her money to pay the mortgage or buy food for the kids and she does something else with it? What is a temporary orders affidavit? What should I say in my temporary orders affidavit? I don’t have a lawyer. Do I still have to do this? What if I don’t file anything and my ex files her papers and lies? If I just tell the judge that she lied will the judge fix it? I cared for my child 50/50 before she moved out. Will I have to pay child support now? What if I pay her child support and she doesn’t spend it on the child? Some or all of these questions are probably keeping you up at night. 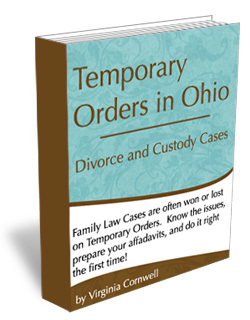 Many of them are answered in this book, Temporary Orders in Ohio Divorce and Custody Cases. To get all the answers you may have to consult with an attorney of your choice, licensed in your state. The author of this book is a licensed attorney practicing in Ohio. REMEMBER THIS: Whatever you’re going to do, don’t dink around. If you’re representing yourself, then get-a-going preparing your own case. If you’re hiring a lawyer then move! move! move! and get a lawyer because there are SHORT deadlines to get affidavits turned in and SHORT deadlines to prepare for a hearing. You are likely to see a quick, satisfactory response to a Motion to Modify Temporary Orders about as many times in your life as you will see a unicorn. Get your copy in just minutes. Buy now for $27 and stop worrying. Have a question or comment? If you'd like to get in touch, just click here.